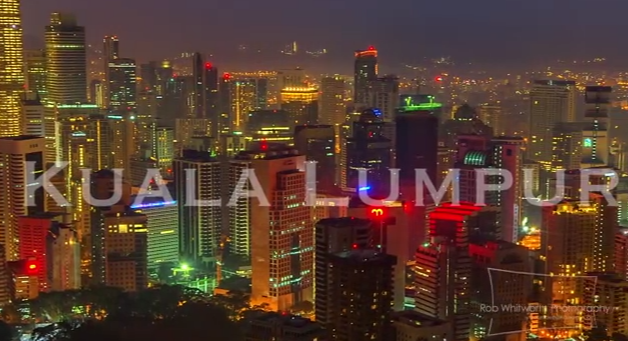 Hypnotic Kuala Lumpur – Our metropolis as you’ve never seen her before. This 5-month long labour of love by time lapse photographer Rob Whitworth highlights the beauty and bustle of Malaysia’s dazzling capital. 5 months. 400 hours of solid work. 4 cameras. 40 shoots. 640 gigabytes of file space. 19,997 photographs. That’s how much work architectural photographer Rob Whitworth put in to create his dazzling 2 minute 36 second time lapse video of Kuala Lumpur. When asked why he chose to create a time lapse video of Malaysia’s largest metropolis, Whitworth’s response is that Kuala Lumpur fascinates him. “It’s hard not to be blown away by the Petronas Twin Towers. At night they are just beautiful. The towers, together with the monorail, give the city an almost science fiction feel. “I was fascinated by the city’s mixture of super-modern buildings existing alongside its varied cultural enclaves and with a little of Asia’s chaos thrown in,”he tells Yahoo! Malaysia. Whitworth, who works out of Singapore, says time lapse has always interested him. He recalls one of his first high school projects, which was to document the passing of time by photographing flowers and fruit in their prime and revisiting them a few weeks later. “I was intrigued at how many things constantly go on all around us which pass by largely unnoticed. Time lapse provides a great way to use a camera to show the world as we cannot see it,” he says. His love affair with time lapse videos has won him critical acclaim. A recent video of Ho Chi Minh City posted online went viral and garnered 1.5 million views. That same video also won the Jury Award at the recent EcoKnights KL Eco Film Festival. Whitworth says he was drawn to the idea of exploring how Kuala Lumpur changes from day to night when he began his project here. “I was walking down Jalan Alor shortly after arriving in KL. It struck me how much the street changed and transformed during the course of the day. “I liked the idea of exploring how the city changes from day to night, how spaces dramatically change during the course of a few hours. This developed into one of the themes shown in the video of scenes switching from day to night,” he says. But enough talk. Here’s Whitworth’s tribute to Malaysia’s modern marvel. Watch it for yourself and bask in the city’s radiance.